The Regency style of architecture refers primarily to buildings built during the period in the early 19th century when George IV was Prince Regent, and also to later buildings following the same style. This is one of four detached houses in Hendford that were built during this period. 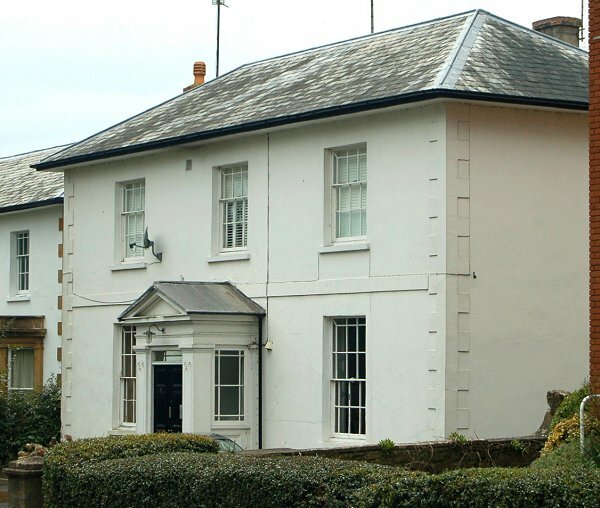 Formerly No 58 Hendford, it was built around 1830 and is shown on Watt's map of 1831 as well as Bidder's map of 1843. The most architecturally interesting feature of this villa is that it has retained the marginal lights - a typical Regency characteristic - in all its windows, somewhat unusual for Yeovil where it seems many windows have been visually ruined by the removal of glazing bars. In 1851 it was the residence of John Penkivil, a doctor of medicine, his wife Jeune, and three servants. 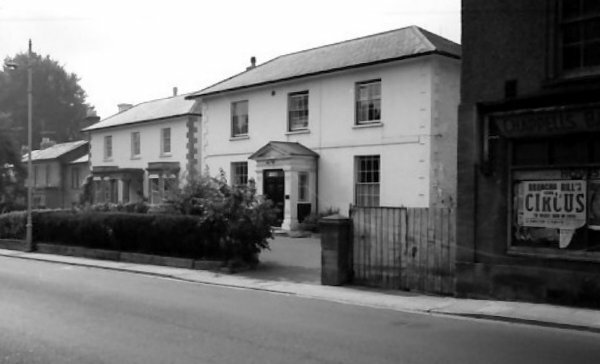 In 1871and 1881 it was the home and surgery of General Practitioner Russell Aldridge, his wife Emily, their two young daughters, a housemaid and a cook. In 1891 is was the home of 'Editor & Author' Alfred Sylvester, his wife Lavinia, their daughter Constance and a general domestic servant. By 1901 it was home to 59-year old Joseph Bellamy, originally from Plymouth, who described has occupation as 'Living on own means', his wife Fanny, their civil Engineer son Franklin, a cook and a housemaid. Villa of c1830 also painted (proudstanding quoins, band course, plinth) hipped Welsh slated roof having wide eaves overhang; end stack left-hand side. 2-storey facade of 3-bays, with 12-paned margined windows on ground floor, 9-paned sashes on first floor: projecting central stone porch (also colourwashed) with soanian antae and margined window side panels; pedimented roof: double 3-panelled doors. 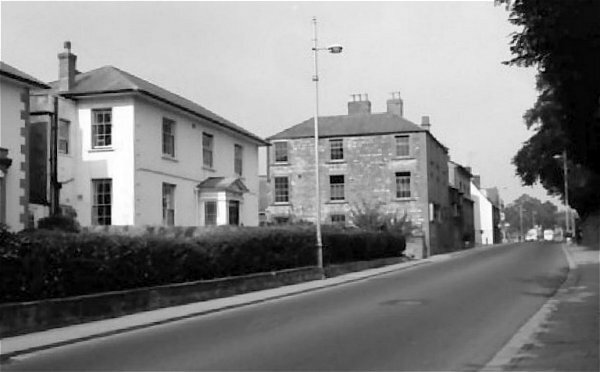 66 Hendford photographed in the 1960s, looking along Hendford towards town with the boundary wall of Hendford Manor just glimpsed at extreme right. Chappell's bakery, formerly Dibben's bakery, is the large three-storey building at centre. Again seen in the 1960s. At right, Chappell's bakery has closed. 66 Hendford's well-proportioned elevation, displaying its fine Regency-style marginal lights to all windows, including the porch. Photographed in 2013. 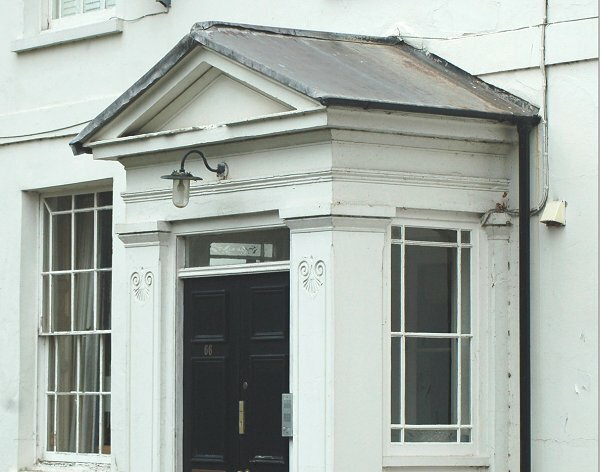 Detail photograph of the porch, perhaps somewhat heavy for the elegant elevation of the villa. Photographed in 2013. Something of a mystery - can you help? Who was JRM? The obvious choice is John Ryall Mayo, later Mayor of Yeovil, but he inherited Old Sarum House in 1818 and lived there until his death in 1870. 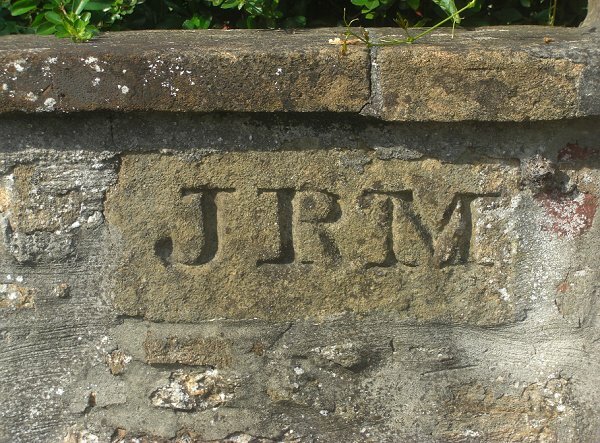 There was no-one with the initials JRM living in Hendford in 1841 and, as shown above, the house wasn't occupied by anyone with those initials from 1851 onwards. Did John Ryall Mayo have the house built? If anyone knows for sure, please contact me.